Like his sire GreyBeard Captain Jack is has and amazing body type. He is very strong in the bone density and staple length. and fine, truly a spectacular male. Last year Jack sheared nearly 9 pounds of fleece, which was nearly 6 percent of his body weight, tremendous coverage! For his 2008 shearing he sported 9-1/4 pounds of fleece, again, nearly 6 percent of his body weight. He has a terrific, mild mannered disposition, like his dam, Desni, and we have found that he passes on these wonderful traits to his offspring. 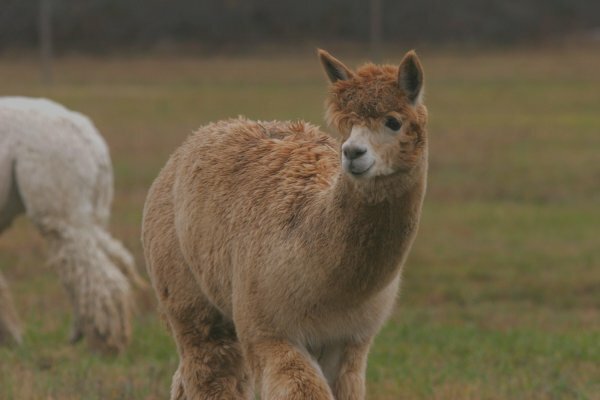 We have been so fortunate to have two healthy cria by Captain Jack this year. He throws solid colors, slightly darker than their moms. followed by Kristina's medium fawn female, Jackie O. 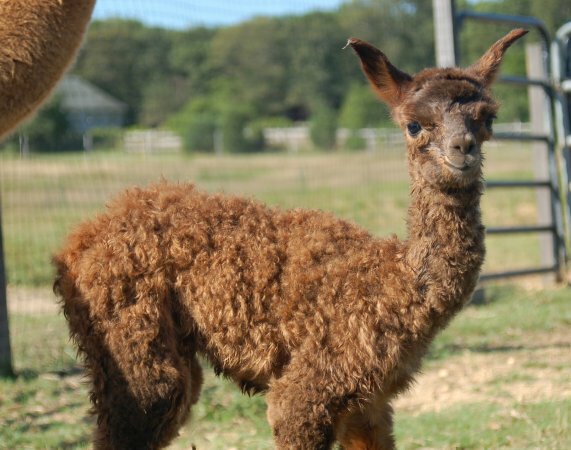 We would be happy to have another farm take advantage of Jacks ability to produce beautiful cria, that we are able to offer Captain Jack for sale, with three retained breedings to potentially have a male offspring. 2007: Nearly 9 pounds of fleece-very dense. 2008: Over 9 pounds of fleece nearly 6% of his body weight! With Captain Jack in the show ring with his sister Island Alpaca Angelina his Dam Desni D652 AOA took First Place in "Produce of Dam" at the 2007 Empire Extravaganza. 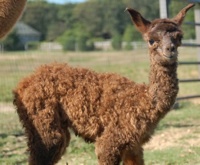 Below is his first cria, Midnight's Gold Nightengale. See her in the show ring this spring! Desni is one of our most prized foundation females. She is a tremendous mom and has the most gentle disposition. Her body and presence is terrific. 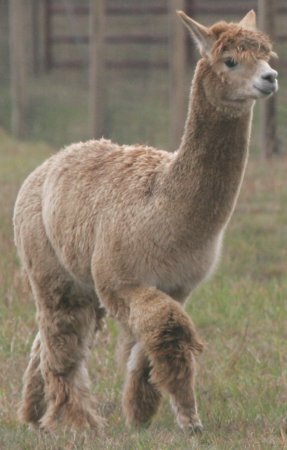 GreyBeard is a full Peruvian, dark silver grey herdsire. He is a 8x Champion and has produced numerous blue ribbon plus winners. He has a light silver grey neck and a dark silver grey body. His body type is amazing! Strong in bone, dense and fine for a dark silver grey. His staple length grows annually over 5 inches and some of his offspring have reached close to 6.5 inches in a yearly growth, like his son, Captain Jack which had nearly 6 inches! GreyBeard too, is truly a spectacular male - one of a kind. Neruda recently sold for $205,000 and if you ask us - GreyBeard has the better overall package. He has duplicated himself in color 4 times - that is 4 of his over 25 offspring are marked in color similiar to him! That is an amazing achievement in itself as this color is very rare and hard to reproduce - certainly with this consistency!